Gleeson Crowe has found his prize: the miraculous child who can heal the sick and build his ministry to protect the righteous and judge the wicked, and he’s not about to give the child up, even to Eamon who has come for his son. But Gleeson is blind to those inside Stonefall who would betray him for their own purposes. 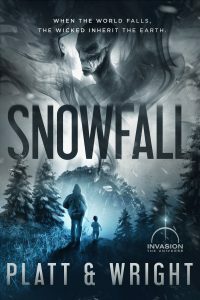 Snowfall is the second book in Sean Platt and David Wright’s Stonefall trilogy, set in the bestselling Invasion Universe. If you enjoy watching the world crumble and the survivors struggle to survive, pick up your copy today. AVAILABLE NOW FROM YOUR FAVORITE EBOOK RETAILER!